The roots of the Boxer Rebellion can be found in the 1895 Euro-centric settlement after Japan's defeat of China in the Sino-Japan War. This settlement allowed Austria, France, Germany, Great Britain, Italy, Japan, and Russia all to claim exclusive trading rights with specific areas of China. These areas were referred to as "spheres of influence". Some countries went so far as to claim to actually own the land within it's sphere of influence. This already volatile mix was complicated when the United States acquired the Philippines in the 1898 settlement of the Spanish-American War. The United States had been left out of the Sino-Japan settlement, but now that it had a part of Asia, it wanted a share of China, too. China's Empress Tsu-Hsi did not want to grant any more spheres of influence to western nations, and rejected the attempts of the United States to gain these trading rights. John Hay, the United States Secretary of State, did not think that people would be in favor of a U.S. war with China, so soon after the Spanish-American War, so he attempted another means to gain influence in China. Hay contacted the governments with Chinese spheres of influence, and tried to persuade them all to share trading rights equally, including the United States. Hay named his idea the 'Open Door Policy'. The other governments all responded that they agreed in theory, but refused to sign anything. Hay asserted that this theoretical agreement constituted real agreement, and considered the Open Door Policy agreed upon. It was in this disorganized squabbling of foreign ownership over Chinese trade that the Boxer Rebellion began. In 1899 the I Ho Chuan, loosely translated as the Fists of Righteous Harmony, which westerners loosely translated to 'Boxers' began efforts to increase membership. The Boxers were a society of zealots from the north of China that believed they had magical powers and were invulnerable to bullets and pain, and that "spirit soldiers" would rise from the dead to join them in their battles. At the time of the Boxers' formation, northern China was suffering from extreme draught conditions, and people were starving. The Boxers initially wished to overthrow the Empress, feeling she had let the people of the north down. The Empress, however, was wise enough to encourage the Boxers, and successfully re-directed their wrath toward the foreigners in China. In early 1900 the Boxers began brutally attacking westerners. The first attacks were in the countryside. Nervous foreigners in the city of Beijing approached the Empress for help. The Empress, who had been encouraging the Boxers, promised the westerners that she would stop the Boxer efforts, but in reality did nothing. 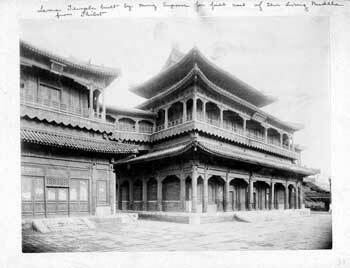 By mid-June 1900, foreigners and Chinese foreign-sympathizers were contained in a compound in the center of Beijing. They held out for almost two months, until the United States, still eager to gain a strong presence in China, led a force 9000 strong into China, working their way inland from the coast. On August 14, 1900, Empress Tsu-Hsi fled the capitol, and the Western forces effectively won the siege against the Boxers. As the leader of the intervention efforts, the United States was part of the settlement, and John Hay was finally able to assert his Open Door Policy, which was expanded to include all of China. In 1901 China was forced into disarmament.